Here is the Reuters photograph with the caption: U.S. President George W. Bush meets with Chinese Human Rights activists in the Yellow Oval Room of the White House May 11, 2006. From L-R: Bush, Li Baiguang, Wang Yi, and Yu Jie. President Bush welcomed to the White House three human rights activists from China, including one whose Internet blog was blocked by Chinese authorities after it was nominated for two top international awards. The three - author Yu Jie, law professor and blogger Wang Yi and legal scholar Li Baiguang - are active in the house church movement, an independent movement of Protestant organizers who have been hit for months by a government crackdown in which many movement leaders have been arrested. The movement's name reflects its reliance on people's private homes for services, not churches, which are banned unless approved by the government. Unfortunately, defeat has been snatched from the jaws of victory as this meeting has torn asunder the democratic/human rights movement inside China. Practically all the famous names are involved: Yu Jie, Wang Yi, Li Baiguang, Guo Feixiong, Gao Zhisheng, Fan Yafeng, Fu Xiqiu, ... What happened here? The point of contention is whether Bush was meeting with Chinese Christians or Chinese human rights activists. The original invitation list was Yu, Wang, Li plus the non-Christian human rights activist Guo Feixiong, all four of whom were attending the Freedom in China Summit 2006 sponsored by the Institute of Chinese Law and Religion and Hudson Institute. 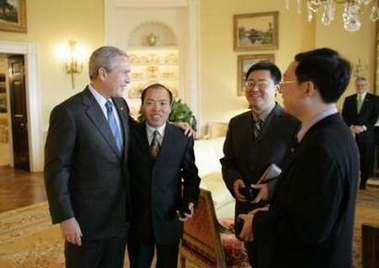 On the morning of May 8, Mr. Fu Xiqiu informed me that US President Bush intends to meet with the mainland Chinese people attending the Freedom in China Summit 2006 conference. After lunch, I returned to Mr. Fu's office. Mr. Fu arrived and suddenly said, "Feixiong, I have something to tell you." Before he finished, Wang Yi and Pastor Zheng also entered and said, "Feixiong, we have to say a prayer to God. Please leave us for a while." So Fu, Wang, Yu and Zheng embraced themselves. Several minutes later, in the adjacent room, Fu and Wang announced to me: "The White House is only inviting Christians to this meeting. You are not a Christian. We have prayed to God and we have decided not to let you participate." Wang Yi specifically told me: "Feixiong, you are in politics. You are mixed in with the democratic movement, whereas I am defending freedom of religion. Therefore, I cannot let you go." I negotiated with Fu while maintaining a low-keyed tone. I did not quarrel with anyone, because I didn't want to turn this into a disgraceful farce. But the manner by which the four Christians Wang, Yu, Zheng and Fu embraced themselves together to pray to God and then strip away my right to attend a normal diplomatic meeting -- this scene will be forever etched in my mind. ... When I spoke to lawyer Gao Zhisheng in Beijing, I said: At the time, I pointed out to Wang Yi: 'Meeting Bush or not may be important to you people, but it does not matter to me.' But I could not stand this illegal conspiracy to prevent me from my right to participate. To me, this was a tremendous insult. Besides I am not the only who got hurt. Fan Yafeng began sobbing over the telephone because hurting me was also hurting him -- he was stabbed several times in the back by his personal friends Wang Yi and Yu Jie; this shows how hurt he was. I told lawyer Gao Zhisheng: "There is some importance as to whether we can see Hu Jintao or Wen Jiabao. We can talk to them about the political reform, rule of law, house church, FLG members, the persecution of the petitioners, grassroots elections -- a meeting of a public member with a public servant. The Chinese free democratic rights project needs the support of the people, media and government of the countries of the world, but it will mainly depend on the efforts of the Chinese people themselves, including all the reformers and people with conscience inside the Chinese government." The fact was that the White House photo, the Reuters caption and the AP report all referred to Bush meeting with "Chinese human rights activists." What was the point then, other than some ridiculous sectarian struggles? Concerning this incident, apart from making one phone call and having one in-person meeting with Professor Fan Yafeng, I have not called anyone else on my own. But the disproportionate thing is that I have received a large number of calls from all over the world. As an extreme indication of what happened yesterday, I am accustomed to turning off my telephone and going to sleep at 9pm, but the telephone calls lasted until past 1am when I was too dry-mouthed and exhausted from talking that I had to cut off the power supply to the telephone. In the meantime, any other signals from the White House meeting have been washed out.